The Select Committee on Pension Policy is holding a committee meeting on December 12th. The meeting starts at 10:00 a.m. in House Hearing Room B.
Click here to go to TVW to watch the meeting. Click here to read the meeting agenda. The Select Committee on Pension Policy is holding a committee meeting on November 14th. The Full Committee meeting starts at 10:00 a.m. in House Hearing Room B. The Executive Committee will meet at 12:20 p.m. in House Conference Rooms B15/18. 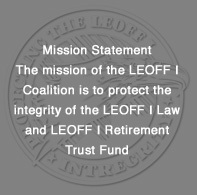 On Tuesday, October 17, LEOFF 1 Coalition President Andy Wilson, Board Member Bill Dickinson, and Lobbyist Joyce Willms were present at the Select Committee on Pension Policy Meeting. The agenda included Recommendation to PFC on Long-Term Economic Assumptions, Preliminary 2018 Meeting Dates, OSA Update, Public Hearing with Possible Executive Session, Update: Subgroup on Tribal Schools, Plans 1 COLA Proposal Pricing Results, Media Alert: Seattle Police Off-Duty Employment.